This belongs in the sub-genre of 'action horror' (for want of a better name) - a mixture of classic scares and stunt-heavy action, usually involving car chases. 'Scary car' movies started with Duel, but I'd include Death Race 2000, Race With The Devil, The Car and the Phantasm movies. The genre peaked with The Hitcher (1986) and the Maniac Cop films. However, recent additions include Joy Ride and Jeepers Creepers. Anyone think of any other horror films full of scary auto action? 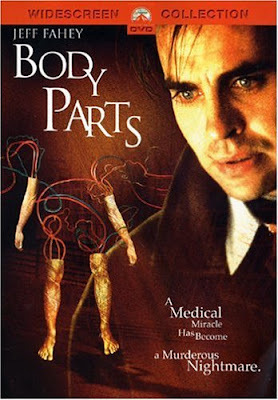 I first saw this 1991 gem Body Parts on TV. It was so enjoyable that I tracked down the laserdisc in order to see the whole 2.35 widescreen image. It was a surprise that such a well-made film, well-written, action-packed and bloody horror had passed me by on its cinema release. This is far-fetched fun that should have been a far bigger hit. Without the necessary starpower, it must have just snuck out. Jeff Fahey peaked the following year when he starred in The Lawnmower Man (billed higher than Pierce Brosnan). He was also memorable in the underrated Psycho III (1986) and stole many scenes in Planet Terror(2007). Fahey is also due to be in next year's Grindhouse spin-off Machete. Perennial eccentric Brad Dourif is always excellent, but again not famous. His roles are usually awesome cameos like in Alien: Resurrection and Dune. But he also shone in more substantial roles such as The Exorcist III and as bad haircut Billy in One Flew Over The Cuckoo's Nest (1975). I always get his roles in Body Parts and Dario Argento's Trauma (1993) mixed up. Lindsay Duncan, as a benevolent modern day Dr Frankenstein, normally does TV drama but has risen to the top of her field - notably in the Catherine Zeta-Jones role in the original TV version of Traffik (1989), which is recommended more highly than the film version of 2000, and more recently in a British TV movie as Margaret Thatcher. Body Parts has a tight script by director Eric Red, but the story has quite a history, being based on the novel Choice Cuts by Pierre Boileau & Thomas Narcejac. These Frenchmen also wrote the novels that inspired Hitchcock's Vertigo and the original Les Diaboliques. They also worked on the script of the haunting Les Yeux Sans Visage (1959, Eyes Without A Face), one of the only French horror films before this recent glut of gallic torture-tainment. 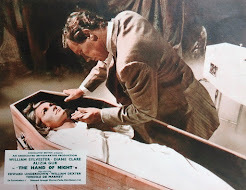 Their novel Choice Cuts is in turn a twist on an even older short story filmed twice as The Hands of Orlac (1924 and 1960) and famously as Mad Love (1935, from which there's also a great visual quote in Body Parts). Eric Red honours the story's heritage while updating it and adding all the ingredients befitting a horror or an action movie of the time. He also wrote Kathryn Bigelow's Blue Steel (1989) and Near Dark (1987), two of her best films. He directed a few films, including this one. The only misstep is an absolutely ridiculous car chase where two people are handcuffed together while sitting in different cars! At the time, Body Parts made the front cover of Fangoria. The prosthetic gore fx are creative, nasty but gratuitously necessary to the story. 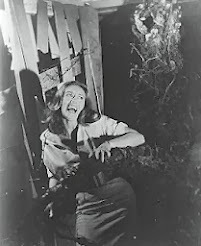 The gothic soundtrack reminds me of John Williams' The Fury crossed with Bernard Herrmann. 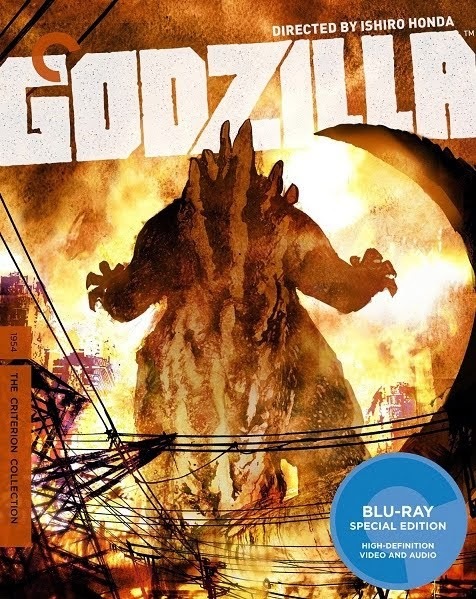 This was on DVD but is now a sought-after OOP disc. A reissue must be on the table soon, please? There's a great career interview with Eric Red here. Here's another review, but full of spoilers and many tasty/tasteless screengrabs. i seem to remember that this movie had the misfortune of opening around the same time jeffrey dahmer was arrested and the producers pulled their ads. THE HAUNT OF HORROR #1 (1973) - love that cover!